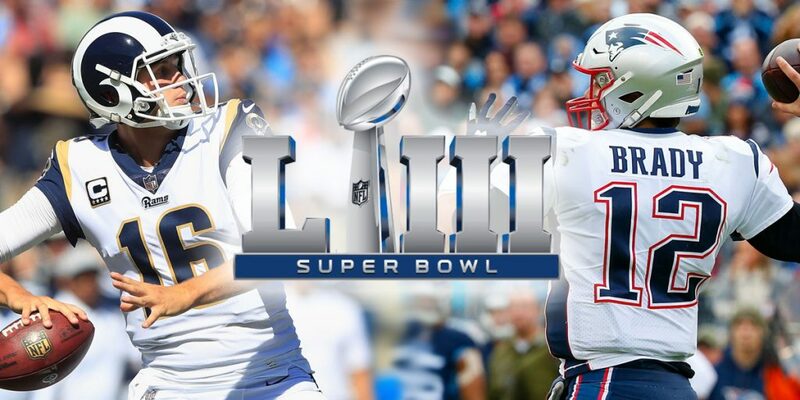 On Sunday, the Los Angeles Rams will face off with the New England Patriots in Super Bowl LIII. 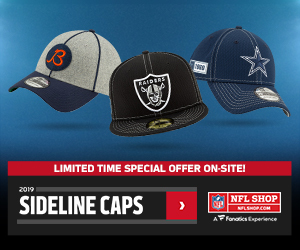 Both teams received a Bye into the Divisional Round, where the Patriots knocked off the Los Angeles Chargers, and the Rams outlasted the Cowboys. In the Conference Championship round, both teams needed Overtime but eventually punched their ticket to Atlanta. The Rams won a controversial game over the Saints in New Orleans, while the Patriots upset the Chiefs in Kansas City, scoring a TD on their first possession of OT. Currently, the Patriots are -2.5 point favorites for the game in Atlanta’s Mercedes-Benz Stadium. We’ll break down each position below and make our pick. For Los Angeles, Jared Goff is coming into his own and leading the franchise to some amazing success. The 24-year-old had a fantastic season, notching 32 TDs compared to 12 INT. He threw for 4,688 yards and added 2 rushing TD for good measure. In the Divisional Round against the Cowboys, the Rams really leaned on their RBs, leaving Goff to throw for only 186 yards. With that said, he didn’t make any mistakes, and the Rams were able to plod on towards their victory. In the NFC Championship, Goff threw for 297 yards, 1 TD and 1 INT, but the INT came on a ball that tipped off RB Todd Gurley’s hands. Overall, Goff showed fantastic poise, bringing his team back into contention after the Saints jumped out to an early lead. He will need to be at his best if he wants to knock off (arguably) the greatest QB of all time in this contest. Tom Brady, after affirming there’s no shot he retires this season, will play in his 9th Super Bowl. Should the Patriots take the game, it would be Brady’s 6th Super Bowl win at the age of 41. Brady is 17 years old Goff’s senior but has proven he still has the ability to play at an elite level. This year, he threw for 4,355 yards, including 29 TDs vs. 11 INT. In the Divisional Round, Brady was masterful, completing 34 of 44 passes for 343 yards and a touchdown against the stout LA Chargers defense. In the AFC Championship, Brady’s statline (30-46/348/1TD/2INT) wasn’t nearly as impressive, but boy was he clutch. He converted multiple 3rd downs, made some amazing throws late, and led his team down the field in Overtime to clinch the victory. Brady has a chance to further bolster his case in the G.O.A.T conversation with a victory on Sunday. LA has the game’s best RB in Todd Gurley. Both the Rams and Gurley have claimed that the 24-year-old RB is healthy, despite the fact that he played less than half of the snaps in the NFC Championship game. In that game, Gurley rushed only 4 times (one for a TD) and caught only one pass. In the Divisional Round, he ran 16 times for 115 yards and a TD. 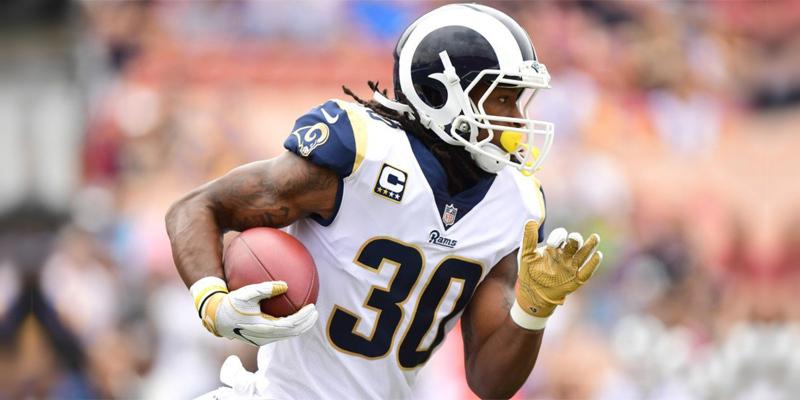 Gurley’s true status is a mystery, but having a week off in between the Championship round and Super Bowl should undoubtedly help any ailment that may be slowing him down. This season, Gurley was his usual amazing self. Despite missing 2 games, he logged 1,251 yards rushing, along with 17 TDs on the ground. He also caught 59 passes for 580 yards and 4 TDs, proving he’s one of the most effective dual threats in the NFL. In addition to Gurley, the Rams also have CJ Anderson, who they just recently signed in mid-December. Since signing with the Rams, Anderson has been electric. In two regular season games, he ran for 299 yards and 2 TDs. Then, in the Divisional Round, he went off for another 123 rushing yards and 2 TD, out-carrying Gurley in the process. He then dominated the usage in the Championship Round last week. I expect to see both RBs play in the Super Bowl, but the usage split remains a mystery. With how these RBs have been performing as of late, though, New England will have to slow them down if they want a chance to win here. New England has been employing a 3-headed monster for the larger part of the season. Their depth is fantastic, and Josh McDaniels has found a way to use all of these players to their strengths, causing fits for opposing defenses. Sony Michel, the rookie from Georgia, burst onto the scene with an effective season, logging 931 yards and 6 TD in only 13 games. Michel has proven to be a fantastic early-down option for the Patriots and has been wildly effective this postseason. In the Divisional Round, Michel ran for 129 yards and 3 TD on 24 carries, absolutely dominating the Chargers defense. Then, in the Championship Round at Kansas City, Sony scored another 2 TD on 113 yards rushing. Clearly, the Patriots have a young stud and he’s part of a potent rushing attack to take the pressure off of Brady when needed. James White really took on a larger load this year with the departure of Dion Lewis, turning in his best season as a pro. He logged 425 yards rushing and 751 receiving yards on 87 catches. Clearly, White has a propensity for catching the ball and is widely regarded as one of the league’s best running routes out of the backfield. Against the Chargers, White caught 15 (yes, 15) passes for 97 yards and utterly dominated the LA defense. He followed that up with another 72 yards against Kansas City, proving he’s an invaluable part of any game plan. Finally, Rex Burkhead, the veteran out of Nebraska, missed 8 games this season but is back at 100% for New England’s run at a Super Bowl. He made the most of his 12 rushes last week, scoring twice, including the game-winner in Overtime. Burkhead also scored against the Chargers, proving he has a nose for the end zone and that he can help the Patriots in clutch situation. 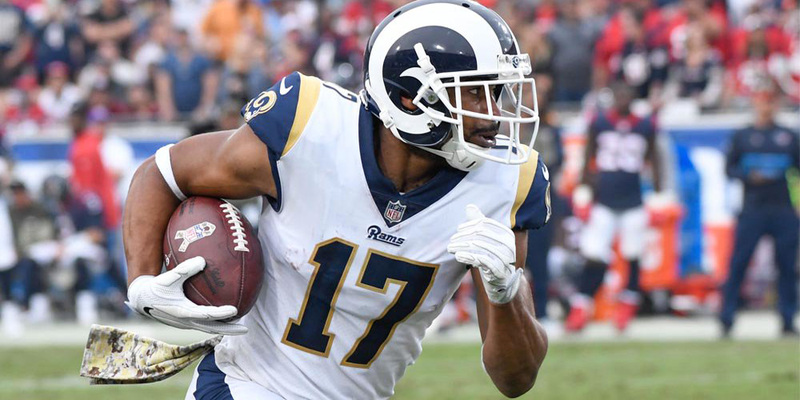 Los Angeles touts a potent WR tandem in Brandin Cooks and Robert Woods. This year, both receivers were quite effective. Cooks logged 80 catches for 1,204 yards and 5 TD. Woods had his best season as a pro, catching 86 balls for 1,219 yards and 6 TDs. Both have been effective this postseason, with Cooks turning in a standout performance in New Orleans, where he grabbed 7 balls for 107 yards. Cooks has the reputation of being able to stretch the field and could pose problems for the New England secondary. It should be recognized, though, that New England was able to completely shut down Tyreek Hill in the AFC Championship, and surely knows Cooks inside and out as his previous employer. In his 2nd year out of Texas A&M, Josh Reynolds has been a bright young player for the Rams. He turned in a 74-yard game last week, making a big catch in the second half to put LA in scoring position. He will need to be effective to take the focus off of Cooks and Woods if the Rams want to have a chance in this one. Los Angeles also has TEs Gerald Everett and Tyler Higbee, who combined for just over 600 receiving yards this season. Higbee did haul in a TD in the NFC Championship and make some clutch grabs late, though, and Everett has flashed some real ability in his short career. Look for them to be Red Zone options on Sunday. New England likes to spread the ball out, but their two fixtures over the years have been WR Julian Edelman and TE Rob Gronkowski. After missing 4 games due to suspension, Edelman turned in a solid season, logging 850 yards and 6 TDs. He made some amazing catches late in the AFC Championship to convert multiple 3rd-down plays, before eventually ending with 96 yards receiving. He snagged 9 balls for 151 yards against the Chargers and was seemingly impossible to cover. Let’s not forget, he was a QB in college… so there’s a chance the Pats might dial up a nice trick play to let Edelman show off his arm. Rob Gronkowski had a challenging season. He missed 3 games and turned in only 682 receiving yards and 3 TDs. This is the first time since 2010 that Gronk has played more than 11 games and failed to eclipse the 700 yards receiving threshold. Amid rumors that this could be his last game, Gronk turned in a signature performance against the Chiefs, catching 6 balls for 79 yards. He also reeled in an amazing sideline grab with 45 seconds left to allow the Patriots to take the lead. This extra week off before the Super Bowl will certainly help the injured Gronkowski heal up some, but it remains to be seen if we’ll see him play again after Sunday. In any event, he has the chance to take over a game at a moment’s notice. 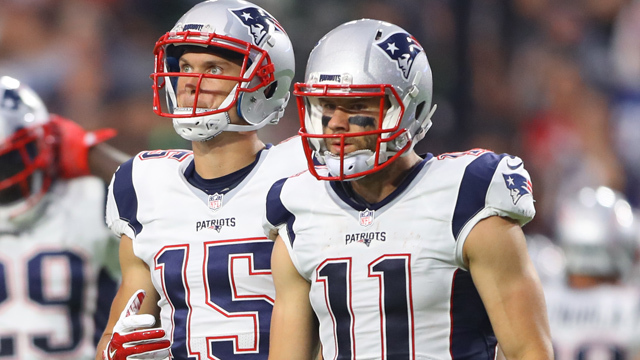 Chris Hogan had an up-and-down regular season but has become more involved in the postseason. He caught 5 balls for 45 yards against Kansas City and could prove to be another solid option for Brady in Atlanta. Cordarrelle Patterson and Phillip Dorsett are also ancillary options in the New England offense. With how much the Patriots spread the ball out, its possible they get involved at any moment. So far this postseason, both defenses have excelled. The Rams, despite a matchup with the Saints last week, have ceded only 598 yards and 22.5 ppg this postseason. Similarly, New England has given up just 27 more yards, but a full 7 points per game more than the Rams. The Rams are flush with budding stars, led by one of the league’s best players, DT Aaron Donald. He’s utterly dominant, having logged 20.5 sacks so far this year from an interior line position. The All-Pro has the chance to take over any game and should cause problems for the Patriots. Donald’s presence, along with Ndamukong Suh, could make things quite difficult for the breakout rookie Sony Michel. I wouldn’t be shocked if Michel was less effective in this contest, and the Patriots had to work more runs to the outside, and rely on White’s pass-catching ability to be successful out of the backfield. On the perimeter, the Rams have a fearsome duo in Aqib Talib and Marcus Peters, who will aim to slow down the likes of Edelman, Hogan, and Gronkowski. New England touts a defense that is always prepared for their competition. Stephon Gilmore and the McCourty Twins will be responsible for slowing down Cooks and Woods on the outside, while hard-hitting Patrick Chung will patrol over the top in the safety position. The front 7 will be pivotal in slowing down the Rams’ rushing attack, so look for the likes of Trey Flowers, Malcom Brown, and Deatrich Wise to slow down Gurley and Anderson up front. Kyle Van Noy leads the New England Linebacker corps along with Dont’a Hightower, as they will also be responsible for clogging things up and tightening the running lanes. Overall, both defenses are formidable and will be tested against strong offensive squads in this Super Bowl. In this Super Bowl, we have a battle between experience and star-studded youth. The coaches in this contest couldn’t be more different. Bill Belichick (66) is twice the age of Sean McVay, and is regarded by many as the best coach of all time. McVay, on the other hand, is seemingly leading a Renaissance of young coaches in the league with his uncanny memory, fantastic offensive gameplans, and ability to mold a franchise QB out of Jared Goff. Additionally, Tom Brady is 17 years the elder of Jared Goff. In this matchup, the two QBs from California will go head-to-head. I think that both teams have fantastic offenses and formidable defenses. In fact, I’d probably give the Rams the edge on both sides of the ball, if Todd Gurley is at full strength. I think that the Rams’ defensive front could shut down Sony Michel, and cause the Pats to utilize Rex Burkhead and James White more than they’d like. White has proven his ability to shine under the big lights before, so look for him to pick up the slack. Over the years, New England has made sure to hone in on the opposing team’s best player and shut them down. Look for them to do that with Todd Gurley this week. If they can shut down the run, and force the Rams to throw the ball more than they’d like, it could give the Patriots a chance. With that said, the young Goff did outperform Brady throughout the season… so he might be able to handle the added pressure. But coming off of a loss in last year’s Super Bowl, you can bet that Tom Brady has been laser-focused for this game since last February. I’ve watched this man move mountains, and I am not going to be the one to pick against him. Not today. 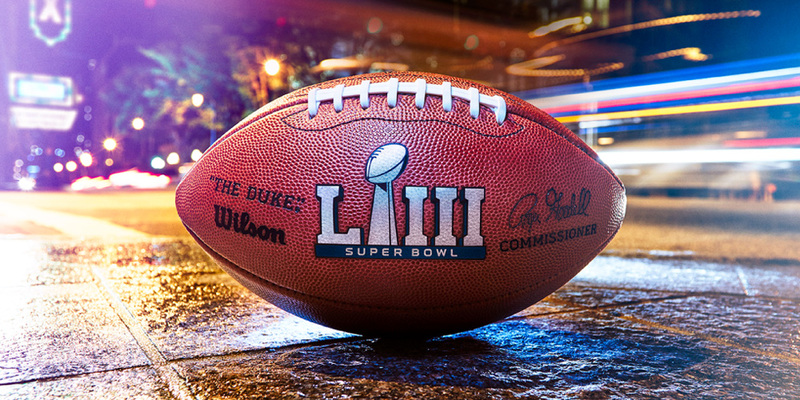 I’ll take New England (-2.5) to win Super Bowl LIII by a score of 31-27.